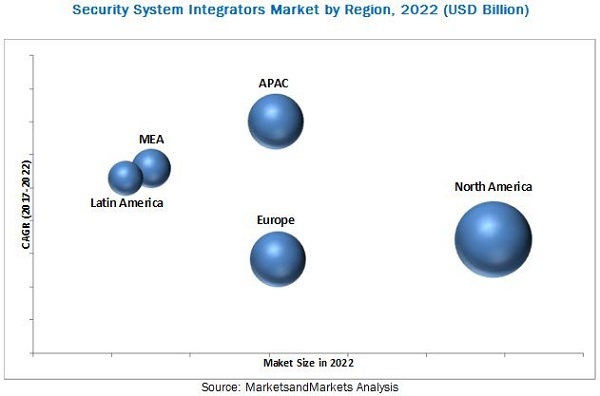 [143 Pages Report] The security system integrators market was valued at USD 8.89 Billion in 2016 and is projected to reach USD 14.72 Billion by 2022, at a Compound Annual Growth Rate (CAGR) of 8.6%. The base year considered for the study is 2016, and the market size is calculated from 2017 to 2022. The objective of the report is to define, describe, and forecast the security system integrators market by security type, organization size, industry vertical, and region. The report analyzes the opportunities in the market for stakeholders by identifying the high-growth segments of the market. 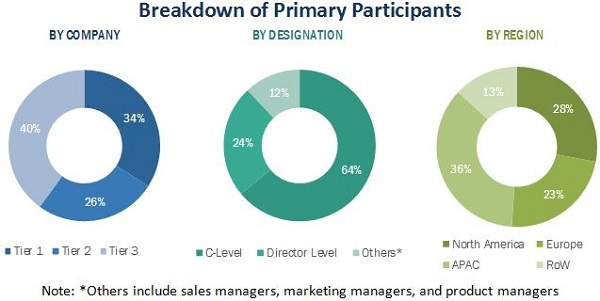 Furthermore, the report profiles the key players of the market and comprehensively analyzes their core competencies, such as new product launches, acquisitions, partnerships, agreements, and collaborations. Moreover, the report also covers detailed information regarding the major factors influencing the growth of the market (drivers, restraints, opportunities, and challenges). The security system integrators market comprises major service providers, such as Cisco Systems, Inc. (US), FireEye, Inc. (US), Hewlett Packard Enterprise (HPE) Development LP (US), International Business Machines (IBM) Corporation (US), McAfee, LLC (US), Accenture BCR (Ireland), Cognizant Technology Solutions U.S. Corporation (US), Deloitte Touche Tohmatsu Limited (US), HCL Technologies Limited (India), Wipro Limited (India), CIPHER Security LLC (US), Integrity360 (Ireland), Vandis, Inc. (US), Anchor Technologies, Inc. (US), and Innovative Solutions Co (Saudi Arabia). The stakeholders include cybersecurity vendors, government agencies, consulting firms, Independent Software Vendors (ISVs), Value-Added Resellers (VARs), and Information Technology (IT) service providers. Detailed analysis was performed to get detailed information regarding the competitors in the security system integrators market, on the basis of their service offerings and business strategies. The report reviews the major players who offer security system integrators. In addition, the report will outline the findings and analysis on how well each security system integration service provider performs within the MarketsandMarkets criteria. The security system integrators market is expected to grow from USD 9.76 Billion in 2017 to USD 14.72 Billion by 2022, at a Compound Annual Growth Rate (CAGR) of 8.6%. The major growth drivers of the market include the increased network complexities due to third-party application deployment, lack of skilled cybersecurity professionals in enterprises, growing security needs for Internet of Things (IoT), Bring Your Own Device (BYOD) trends, and increasing adoption of cloud-based services. Major security types in cybersecurity include application security, endpoint security, network security, data security, risk and compliance management, and business continuity and disaster recovery. Among the various security types, the data security type is expected to grow at the highest CAGR during the forecast period due to the increasing adoption of encryption solutions among enterprises. The Small and Medium-sized Enterprises (SMEs) segment is expected to grow at a higher CAGR during the forecast period, owing to the increasing incidences of data breaches on enterprise cloud applications, as well as, rise in the sophistication level of cyber-attacks. However, the large enterprises segment is estimated to account for a larger share of the security system integrators market in 2017. Large enterprises were the early adopters of security system integration services, as they have geographically dispersed and complex IT infrastructures. Security system integrators have been adopted by various verticals, including the aerospace and defense; government; Banking, Financial Services, and Insurance (BFSI); IT and telecom; healthcare; retail; manufacturing; energy and utilities; and others (education, media and entertainment, and automotive). The government vertical is witnessing growth in advanced cyber threats, causing harm to valuable assets of the sector. Moreover, due to the rising trend of eGovernance, the cybersecurity domain in the government vertical is expected to grow at the highest CAGR during the forecast period. The global security system integrators market has been segmented on the basis of regions into North America, Europe, Asia Pacific (APAC), Middle East and Africa (MEA), and Latin America to provide a region-specific analysis in the report. The North American region, followed by Europe, is estimated to become the largest revenue-generating region for security system integrators in 2017. This is mainly because in the developed economies of the US and Canada, there is a high focus on innovations obtained from Research and Development (R&D), and technology. The APAC region is expected to be the fastest-growing region in the market. The growth in this region is primarily driven by the rapid digital transformation of the region, high adoption of cloud and web-based applications, and increasing BYOD trends. The major restraint for the security system integrators is the difficulty in expanding their business at a global scale. The service providers have business restricted to their geographical presence only, and to expand their business in other regions, they need to open new offices and hire more workforce. These business complexities restrain their growth to generate higher revenue. The major security system integrators market include Cisco Systems, Inc. (US), FireEye, Inc. (US), Hewlett Packard Enterprise (HPE) Development LP (US), International Business Machines (IBM) Corporation (US), McAfee, LLC (US), Accenture BCR (Ireland), Cognizant Technology Solutions U.S. Corporation (US), Deloitte Touche Tohmatsu Limited (US), HCL Technologies Limited (India), Wipro Limited (India), CIPHER Security LLC (US), Integrity360 (Ireland), Vandis, Inc. (US), Anchor Technologies, Inc. (US), and Innovative Solutions Co (Saudi Arabia). The strategy of partnerships, agreements, and collaborations is the key strategy majorly adopted by the market players to offer feature-rich products and services to their customers and penetrate deep into uncatered regions.